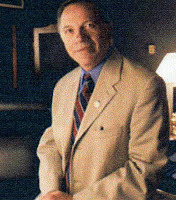 Tom Tancredo may just be my man in 08. Tom Tancredo has been telling Americans that the U.S. should threaten to bomb Mecca if Islamic terrorists successfully detonate a nuclear device in America. Way to go Tom! In July of 2005, Tancredo said on Fox News, "If this nuclear [terror attack] happens, and if, in fact, we can prove that it was perpetrated by some fundamentalist Islamic - 'Islamo-fascist' (it is really I think what we should call them) - then you might think about this as a threat, the nuclear retaliation on their so-called holy sites. "We are talking about a situation where our very lives are at stake, not just the life of the United States, but of Western civilization," he insisted. A week later, Tancredo told WFLA Florida radio host Pat Campbell: "You know; there are things that you could threaten to do before [a terror attack] happens ..."
The Colorado Republican then explained: "What if you said something like: If this happens in the United States and we determine that it is the result of extremist, fundamentalist Muslims - you know, we could take out their holy sites." Asked if he was talking about bombing Mecca, Tancredo replied: "Yeah." Moreover, the congressman and presidential candidate is not backing down from these comments. He recently told an audience in Iowa, almost exactly two years later, that as president he would advocate the very same position. "If it is up to me, we are going to explain that an attack on this homeland of that nature would be followed by an attack on the holy sites in Mecca and Medina," the GOP presidential candidate said, according to Iowa Politics.com. "That is the only thing I can think of that might deter Islam from doing what they would otherwise do. "If I am wrong fine, tell me, and I would be happy to do something else. But you had better find a deterrent or you will find an attack. There is no other way around it. There has to be negative consequences for the actions they take. That's the most negative action I can think of." He further warned: "The president and this country better figure out exactly what it can do to deter, I underline deter, the next attack. "Deter, not just respond, deter, or else I assure you, we are going to suffer. The extent of which of course I do not know. I know what they are planning and I know what they want. I do not know if they are going to be capable of doing this tomorrow, the next day, or a month from now. I know right now at this moment we have nothing that deters them." If the citizenry of the United States doesn’t elect a president who is willing to pull out all the stops and bury the new traditions of multicultural political correctness and tolerance for an enemy that Tom Tancredo knows is bent on destroying the liberty of America we will lose not only this country but our way of life. I know this, and that is this enemy respects only one thing, and that is raw power and the intent to use it. We should set up and aim ICBM’s at Mecca and Medina now, and let all of Islam know that any attack on the U.S. by Islam will result in the launch of those ICBM’s to the so-called holy sites of Islam, the throne of Allah himself. This Administration should hire the best journalists, advertisers, psychologists that this country has to offer to start a campaign to convince Islam that an attack on the U.S. anywhere will definitely result in the leveling of Mecca and Medina. If there is a deterrent against an Islamic attack, this would be it.